Save Us From Sequestration, Mitt Romney! Former Republican presidential candiate and Massachusetts Gov. 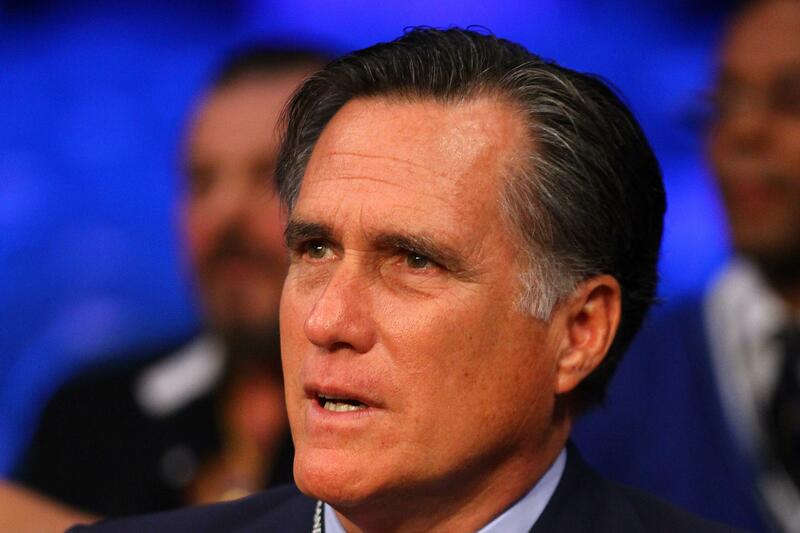 Mitt Romney sits ringside fro the Patrick Hyland and Javier Fortuna WBA interim featherweight title fight at the MGM Grand Garden Arena on December 8, 2012 in Las Vegas, Nevada. A new Pew poll asks voters, who have been paying fitful/no attention to the sequestration debate, how they want it to end. Only a plurality of voters—the margin is 49-40—want to delay the cuts. Independents are split 45-45 on whether to keep the cuts or punt. If we can extrapolate from there to the questions about the deficit, we’ve got a considerable slant toward the GOP’s position. [A]bout three-quarters of the public (76%) say that the president and Congress should focus on a combination of both spending cuts and tax increases; just 19% say the focus should only be on cuts and 3% say it should only be on taxes… Most of those who favor a mixed approach say the focus should be primarily on spending cuts (54% of the public overall). Just 16% of the public say the focus should mostly be on tax increases. So that’s 75 percent of people wanting the solution to “focus” on spending cuts, and 19 percent wanting it to focus on tax hikes. That’s synced right up with Republican rhetoric! But it’s Democrats, not Republicans, who want to achieve the savings with some combination of cuts and taxes. The Senate Democrats’ sequestration replacement has $54 billion in tax hikes—largely from expected “Buffet rule” revenue—and $56 billion in cuts. The (defunct) House Republican plan consisted entirely of cuts. A close look at the composition of both the Senate and the House suggest the numbers would be there for Romney to pass some combination of spending cuts and the closing of tax loopholes, as he called for in the 2012 campaign. In the Senate, Romney probably would have courted the 12 red-state Senate Democrats, six of whom are up for reelection in 2014, to support some type of compromise. In the House, his task would be winning over recalcitrant conservatives. If House Democrats were united in opposition, he could afford 17 GOP defections, probably more if the few remaining moderate Democrats joined with the GOP. It’s a little bit easier to do when your party holds the White House, as opposed to fighting in the minority. But the assumption there is that Republicans would have had to swallow tax increases. If Republicans think a President Romney could have broken red state Democrats by proposing an all-cuts plan (which is what Paul Ryan wanted), or a “grand bargain” that would cut entitlements, they’re delusional. In 2005, George W. Bush started a second term with 55 Republicans in the Senate and a hankering to privatize Social Security. He lobbied Nebraska Sen. Ben Nelson, who was up for re-election in 2006. He campaigned in Montana, home of Sen. Max Baucus. He very explicitly tried to make life difficult for red state Dems who didn’t back reform. But the electorate didn’t back reform, either! Baucus, in particular, became a very effective sand-bagger of the Bush idea, and suffered zero consequences.